You’ve got your indoor or outdoor tree up and you’re ready to hang the lights on it. You’ve taken the lights out and carefully unrolled them across the floor. You’ve plugged them into a receptacle or extension cord to test them and. . . they don’t light up. They worked last year—you think. But what do you do now? NOTE: If you have very old light strings, they may very well use older-style screw-in incandescent bulbs. These older strings may not be worth fixing, considering the low cost of more modern bulb strings, which are either small incandescent mini lights or the more modern form, LED lights. Old-style Christmas light strings with screw-in bulbs are best retired when they begin to go bad. 1. Check the Fuses: If one of your light strings isn’t working at all, or if only half of the lights are working—unplug the string and look for a small access door on one side of the male plug. If you find one, open it and inspect the very small fuses inside the plug. There should be two. If one or both of the fuses look black or cloudy, or if you can see that the wire through the fuse has burned in two, you need to replace the ones that look bad. Even if you don’t have spares on hand, look at the old one for a size marking. Three-amp, five-amp and seven-amp fuses are common sizes. 2. If the Fuses Look Okay, or If You don’t Have Fuses: If the fuses appear to be okay—or if your light set doesn’t have fuses—and some of the lights still aren’t working, you can start replacing bulbs. Unlike the regular lights and receptacles in your house, light strings, especially older ones, are often constructed with the light bulbs wired in series. This means that the power goes through each light bulb to get to the next one. If one fails—burns out—the power will stop there. Start from the end of the string with the male plug. That’s where the power comes in, and it travels through the string to the other end. This is slow and painstaking work, but it should pay off. The bulbs are usually mounted into bases that are inserted into the sockets in the string. Grip the plastic base of the bulb and pull it out of the socket (be careful; it's easy to pull the tiny bulb and base apart). Look at the bottom of the socket. You should see two fine, flat wires, resembling small, stiff pieces of ribbon. Straighten those out, and inspect them for corrosion, If they are in otherwise good shape, now take a new bulb and align the two wires in the base with the two slots in the socket, then push in the new light bulb until it is firmly set into the socket. 3. An Easier Option: With LED light strings, a number of tester kits are available that let you quickly test and repair sockets. One type, the LED Keeper, bites into the copper conductors inside the insulation on the wires and allows you to troubleshoot the string in small sections. Once you’ve found the bad area, you repair the problem with small repair modules that come with the tool. When you run out of repair modules, those can be ordered separately. Turn the lights off before going to bed or leaving the house for more than a few minutes. Keep your natural tree well watered—dry wood and needles are more flammable than moist ones. 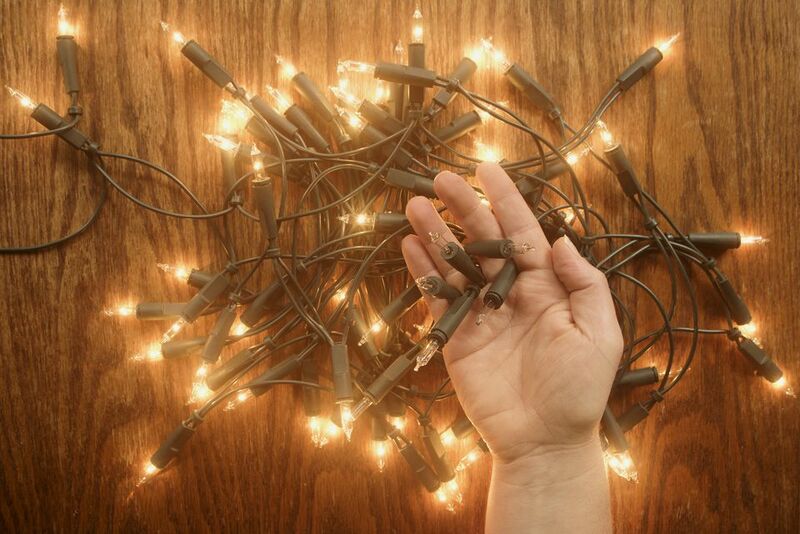 Test the light strings and repair them, if you need to before you pack them away this year.